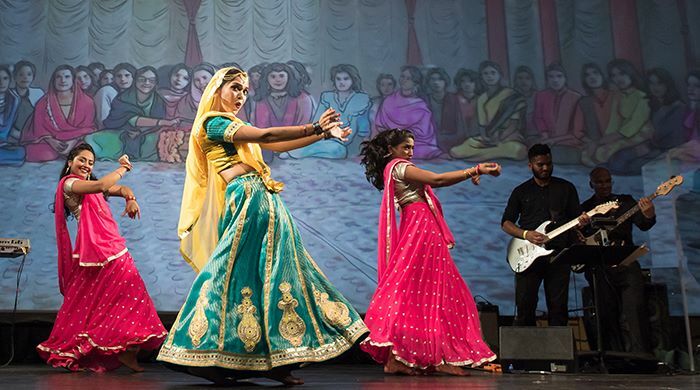 Bollywood Boulevard — a harmonious fusion of live music, dance, and film — leads you from the birth of Hindi cinema to present day. Lose yourself in a film phenomenon that has captured the hearts of billions across the world. Bollywood Boulevard will have you falling in love with the vibrancy, emotions, and heart-pounding beat that inspires the world’s largest entertainment industry. Inspired by the music of R.D. Burman, Lata Mangeshkar, and A.R. Rahman, the dance moves of superstars like Amitabh Bachchan and Priyanka Chopra, and romance as captured by Raj Kapoor and Yash Raj Chopra, experience Bollywood as never before. Join UtahPresents and Saffron Valley for a night of dining and entertainment! The preshow dinner will be at 6PM at Saffron Valley, 26 E Street, SLC, and includes choice of vegetarian or regular Thali. See details below.